Jake is confused. He didn’t know what feelings are and what do do with them. All he knew is that he and his family are so prickly. SO off Jake went with his detective hat to gather clues about feelings. His best friend Mac is angry after a fight and won’t play with him. His sister told him to bug off and to stop bothering her. His mom was too busy surfing the net and wouldn’t talk. His dad as usual was clueless about feelings except anger. What is a feeling? What do you do when it’s an unhappy one that won’t go away? Turns out there are many ways to move unwanted feelings. Jake and his grandma used several Feeling Moving Tools to release angry, sad and confused feelings. Self Talk to take charge of bad feelings. Magic Fingers to tap them out. Huff and Puff to blow them out. Visualizing sending them away. Feeling Moving Tools are fun to do! 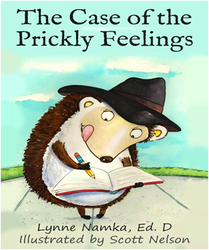 Somehow feelings don’t seem quite so overwhelming or unusual when a little hedgehog has them too!